According to a news article from the Tewksbury Patch, a three-car accident that recently occurred left several injured, including one elderly man with serious head trauma. Witnesses say the accident occurred just prior to 11 a.m. on Main Street in Tewksbury near several local businesses, including Mahoney’s Too and John Ryan’s Pub. When first responders arrived at the scene, they immediately assessed the victims’ condition and discovered the one elderly victim was far more severely injured than the others. They called for a medivac helicopter, which landed at John Ryan’s Pub. The flight crew stabilized the patient and transported him to a local level-one trauma center in the Boston area. Massachusetts State Police also arrived at the scene to conduct a full investigation with its accident reconstruction team. As our Boston car accident attorneys can explain, it is common practice and a matter of police procedure for the Massachusetts State Police to have an accident investigation team conduct a full investigation following a serious car accident. 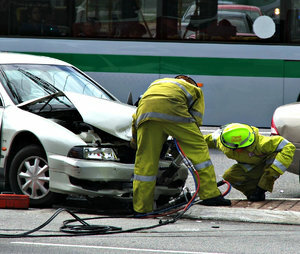 There are a variety of ways in which an accident investigation team will attempt to reconstruct the accident and determine exactly what happened. The first thing they will do is talk to witnesses to get firsthand accounts of exactly what happened. While this is obviously a good place to start, it is important to remember that eyewitness accounts may vary and may even be in direct contrast with one another. The reason for this is not because people are lying, but because people tend to interpret and remember things in a way that is shaped by their past life experiences and cognitive processes. Accident reconstruction teams will also survey the scene of the car crash. It is important to take photographs of the accident scene and make measurements of any tire tracks or skids. This will help car accident investigators know what the vehicles involved were doing prior to the crash. Additionally, most, if not all, cars built in recent years contain sensors that can be used in the event of an accident. Each company has a propriety system for encoding the data on these “black boxes.” Following an accident, the police can go to the car company that manufactured the vehicle involved in the accident and ask that the company download any recorded data from the device and provide a full report to the police. The black box devices are capable of recording things like speed, RPMs, whether brakes were applied and other similar factors. Unlike on a commercial airplane, there is no voice recording from inside the passenger compartment of car. In some cases, inspectors can also examine any vehicle lights, including brake lights and turn signals to see if they were activated prior to the crash. Certain types of lights are designed so, in the event they are destroyed, it is possible to detect their last state of activation. In the event that you were in a car accident that was another person’s fault, your attorney can obtain these investigation reports from the police, and this may assist you in proving your case at trial or obtaining a full and appropriate financial settlement.